US Energy Secretary Rick Perry has asked the Federal Energy Regulatory Commission (FERC) to intervene in wholesale markets to help keep coal and nuclear power plants online. The argument laid out in the Department of Energy’s (DOE) Notice of Proposed Rulemaking (NOPR) is that these sources of power generation, which have been under pressure from weak load growth, cheap natural gas and expanding renewables, have unique value to grid reliability because they can store significant quantities of fuel onsite. Rhodium Group submits the following analysis as comments under FERC docket number RM18-1-000. In these comments we assess the degree to which fuel supply issues have been a driver of electric system outages and whether or not there is a link between “fuel secure” resources and more reliable power systems. We find that fuel supply issues were responsible for 0.00007% of lost customer electric service hours between 2012 and 2016 in the US and that there is no clear relationship between higher system levels of coal and nuclear generation and better system performance with regards to reliability. Sec. Perry has given FERC 60 days to address what he sees as the electricity reliability emergency created by the retirement of “fuel-secure generation” – namely coal and nuclear power plants that can store large quantities of fuel on-site. There have been a large number of coal and nuclear units retired in recent years as weak load growth, persistently low natural gas prices and rapid declines in renewable energy costs have led to reduced profit margins. Natural gas plants cannot store much fuel onsite and rely on a consistent stream of pipeline delivery. Absent large-scale battery or other storage, generation from wind and solar is limited to times of the day when the wind is blowing and the sun is shining. Has the growth in renewable and natural gas generation sources in recent years and simultaneous retirement of coal and nuclear plants created the reliability crisis Sec. Perry warns of? Absent intervention by FERC will additional retirements cause a spike in electric power outages? This analysis explores both questions by examining multiple sources of utility reliability and generation data from the DOE and Energy Information Administration (EIA). Using EIA’s form 861 distribution utility data we examined the frequency and duration of electricity system outages from the average customer’s point of view. Since 2013, EIA has asked all but the smallest utilities to report the frequency and duration of distribution system service interruptions lasting longer than 5 minutes using industry standard protocols.1 Total outage numbers include all service interruptions encountered by distribution utility customers regardless of cause. From there, reports are broken down by whether “major event days” are included in totals and whether an incident is due to “loss of supply.” Major events generally include severe weather or other unusual phenomena that occur less than 10% of the time. Importantly, loss of supply refers to the loss of electric supply to the distribution system and includes a range of possible issues, from a mechanical failure at a power plant to the failure of a transmission substation, as well as weather impacts on those same grid assets. It also includes fuel emergencies at power plants and generation inadequacy. Distribution system customer outages that don’t occur during major events or loss of electric supply incidents are typically due to normal weather events or distribution system operations issues. 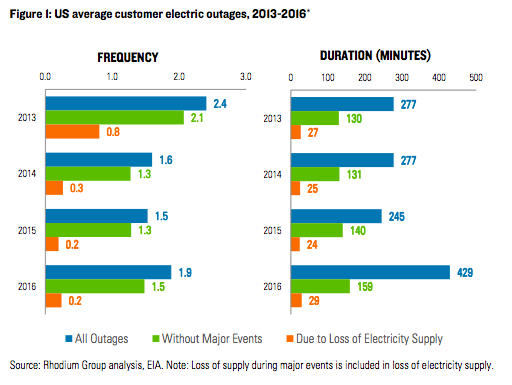 For utilities in the continental United States, the average customer experienced as few as 1.5 outages per year to as many as 2.4 from 2013 through 2016 with major events included (figure 1). Loss of electric supply played a role in as much as 30% of those outages (in 2013) and as few as 10% (in 2016). In 2015 the average customer experienced 1.5 outages a year due to all causes but only 0.2 due to lack of electricity supply. Across these outages, the average customer endured from 245 to 429 minutes of lost service inclusive of major events. However, only 24 to 29 minutes of the duration of these outages (as little as 7%) was due to a loss of electric supply. It is clear that factors related to and impacting the electric distribution system — not a loss of electric supply — were the cause of most customer outages and lost service minutes in this timeframe. 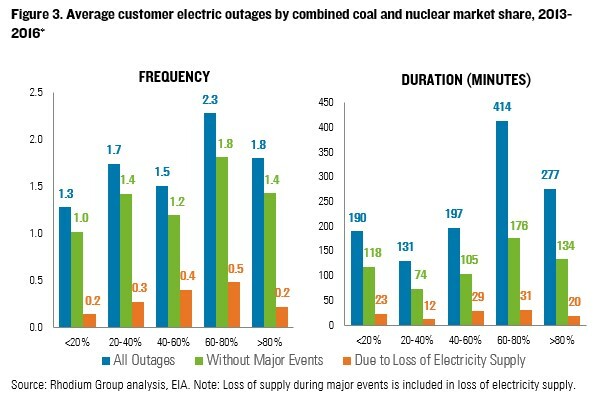 While EIA’s data allows us to establish the relatively small role that loss of electric supply plays in triggering electric distribution customer outages, DOE’s form OE-417 allows us to quantify the frequency and total lost customer service hours due specifically to fuel supply deficiencies and emergencies occurring at power plants. This is a key issue of concern raised by DOE’s NOPR and a major reason for the department’s call for providing additional support for coal and nuclear plants. Whenever a utility experiences a major disturbance in electricity delivery to customers, it is required by law to fill out form OE-417, and submit it to DOE. On that form, the utility is required to list the cause of the disturbance, its duration, and the number of customers affected. These data are then published by DOE and included in EIA’s Electric Power Monthly. We tabulated all the OE-417 reports since the beginning of 2012 to quantify the role that “fuel supply emergencies” (and not other factors causing loss of electric supply to customers) have played in causing outages. This is a period in which 32% of the country’s coal-fired power generating units and 6% of its nuclear-generating units were retired. 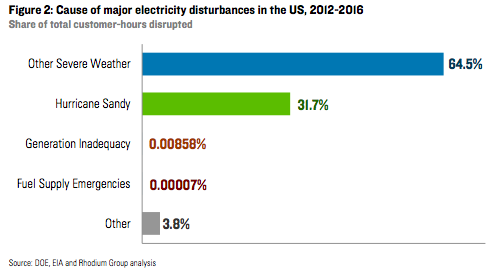 We find that between 2012 and 2016, utilities reported roughly 3.4 billion customer- hours impacted by major electricity disruptions. 96% of those lost service hours were due to severe weather (Figure 2). Fuel emergencies or deficiencies at power plants resulted in 2,382 customer hours of lost service or 0.00007% of the total. 2,333 of those customer hours were due to one event in Northern Minnesota in 2014 involving a coal-fired power plant. Several additional power plant fuel supply emergencies and deficiencies were recorded in the OE-417 data but most did not report a loss of customer service due to these incidents. Apparently, in these instances there were sufficient additional resources available to maintain electric supply to customers. Of the 498 total incidents reported since the beginning of 2012 through the end of 2016, 37 or 7% were categorized as fuel supply emergencies or deficiencies. Of these 37 events, seven did not result in any lost customer hours while 28 reported “unknown” or “N/A” with regard to the number of customers impacted. The remainder are the two events depicted in Figure 2. Of the fuel emergency or deficiency events that disclosed what fuel was at issue, 14 involved coal and 7 involved natural gas. While the NOPR focuses primarily on the possible benefits of onsite fuel supply, it also expresses concern regarding the potential risk of inadequate generation resources during periods of peak demand due to the wave of recent coal and nuclear retirements. Here as well the OE-417 data is illustrative. While “generation inadequacy” resulted in slightly more lost customer hours than fuel supply problems, it still accounted for less than one-hundredth of one percent of the customer-hours impacted by electricity disturbances nationwide between 2012 and 2016. Utilities reported a handful of additional inadequacy events with zero or unknown customer hours lost representing less than 1% of total events. Our analysis demonstrates that from a nationwide perspective, fuel supply issues are a very small driver of electric power outages and total lost electric service. In DOE’s NOPR the department cautions that future retirements of coal and nuclear capacity will threaten reliability. We can assess whether there is reason for concern by analyzing the EIA form 861 reliability metrics for utilities operating in power systems with different amounts of coal and nuclear generation. Using EIA form 923 generation data, we calculated the combined coal and nuclear share of generation in each balancing authority (BA) for years 2013 through 2016 and grouped them into five bins: <20% coal and nuclear, 20-40%, 40-60%, 60-80% and >80%. We then calculated customer weighted average reliability metrics for utilities operating in BAs within each bin. If increasing and/or maintaining the amount of coal and/or nuclear on the grid improved reliability going forward, we would expect to see fewer and shorter outages in BAs with more coal and nuclear generation historically. Instead, we find no clear relationship between coal and nuclear generation market share and the frequency and/or duration of power outages between 2013 and 2016 (figure 3). Indeed, if there is any observable relationship, it’s a slight increase in both the frequency and duration of outages with higher levels of coal and nuclear generation, up to the >80% market share level especially for the frequency of outages due to loss of electric supply. Using this same approach, we’ve assessed what the role of increasing penetration of variable renewable generation such as wind and solar has had on the same reliability metrics. If greater amounts of variable generation threaten reliability, we would expect to see an increase in the frequency and duration of outages for utilities in BAs with higher renewable energy penetration rates. Again, here we see no clear relationship. Reliability metrics are consistent as variable generation increases. The exception is for utilities in BAs with the highest levels of renewable deployment, which experienced the fewest and shortest outages between 2013 and 2016 (Figure 4). Based on our analysis of EIA and DOE reliability and generation data we do not find evidence that fuel supply incidents at power plants are a major driver of electric system outages. We also find that increasing amounts of coal and nuclear generation on a utility’s system has no clear relationship with higher performance regarding reliability metrics. Furthermore, increasing amounts of variable renewable generation on a utility’s system has no clear relationship with lower performance regarding reliability metrics. We conclude that future coal and nuclear retirements alone are not likely to lead to greater or longer electric service outages. Conversely, maintaining or increasing the amount of coal and nuclear generation in a given balancing authority is not likely to lead to fewer or shorter electric service outages. 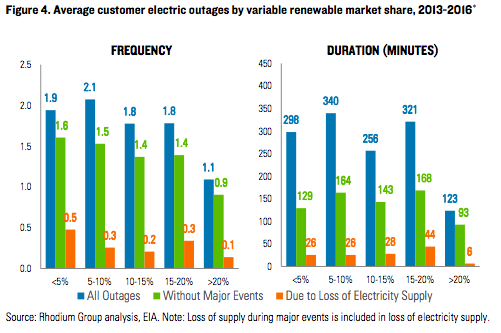 1Data used in this analysis was reported by utilities representing 73% and 55% percent of continental US retail sales for with/without major events and loss of supply respectively from 2012 through 2016. 2016 data used in this analysis is part of EIA’s early release and is subject to revision. ∗ This portion of the analysis was commissioned by the Natural Resources Defense Council and Environmental Defense Fund, but was conducted independently by Rhodium Group, LLC. The findings and views expressed in this note are the authors’ alone.